A couple of weeks ago I caught an episode of Forged in Fire on The History Channel. If you haven’t seen this program, it’s a competition between people who make their own knives – modern day bladesmiths. What caught my attention this day was one of the contestants, Kyle Gahagan, mentioned he offered Bladesmith Therapy for disabled veterans and veterans suffering the effects of PTSD at his forge. I was intrigued and visited his website for more information. In 2002, U.S. Army Colonel Ashton Naylor, returning from a tour of duty in Afghanistan, met a Master Bladesmith in Florida who offered to show him how to make one knife. Ashton says “he was hooked” after that one experience and soon began Naylor Forge. Colonel Naylor carried his tools with him on assignment back to Afghanistan and began by giving hand-made knives to men in his command as a reward for a job well done. He then began offering to teach men the trade as a diversion from the chaos around them. The above photo is the knife his students create, complete with the unit shield on both the blade and the sheath. He used bladesmithing as a way to build rapport at every post he served at after 2002. Colonel Naylor served 32 years in the U.S. Army, 26 in the Special Forces Unit. He is now retired and enjoying his new career hand-crafting tomahawks, bowie knives, kitchen cutlery, and other forged items. Naylor Forge is still open for a fellow green beret or marine in need of a place to talk and a piece of hot metal to forge. The formal name “bladesmith therapy” was coined in 2013, when Nate Bocker, an active-duty U.S. Army Sergeant, also began sharing the craft he loved with the men he served. It was Sgt. Bocker’s belief that learning the craft of bladesmithing could offer fellow veterans a sense of personal accomplishment plus a craft to use later in life. Each student was given a bar of steel to hand-forge, shape, grind and sand. When their blade was complete, they were then given a choice of wood or other materials from which to form the handle. Finally, they chose either leather or Kydex from which they made a sheath for their new blade. By October 2014, 15 students had completed Sgt. Bocker’s Blade Therapy program, each creating at least one knife. Many had gone on to complete additional knives or other forged items. Kyle Gahagan, another veteran bladesmither, decided this operation had outgrown Sgt. Bocker’s garage and private funding. That is when the idea for Resilience Forge began to take shape. July of 2015 saw the formal opening of Resilience Forge NC, a direct result of Kyle Gahagan’s desire to expand the work Nate Bocker had begun in Virginia. The mission and goal of Resilience Forge NC remained the same but expanded support to veterans of North Carolina. 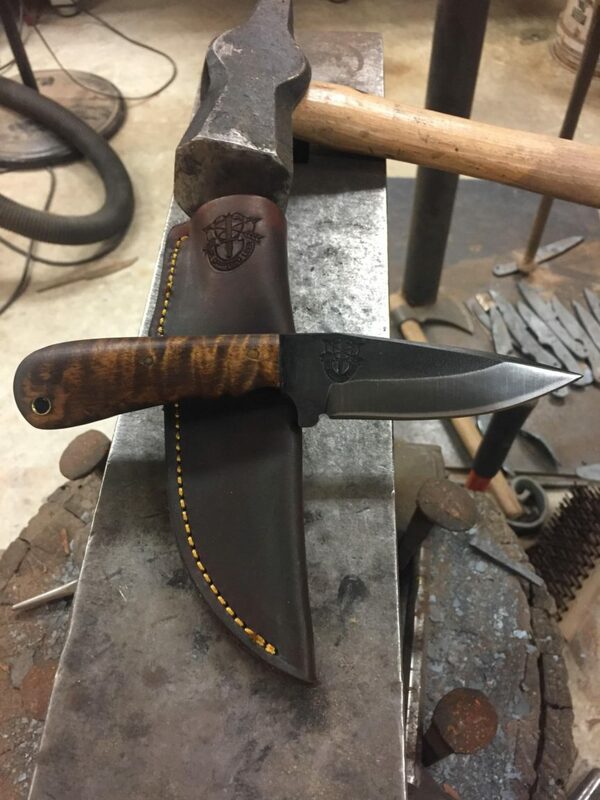 While Gahagan appears to have a somewhat more formal program at Resilience Forge, many veteran/bladesmiths simply invite veterans in for an informal time of sharing memories and learning a new trade. If pounding out old demons while beating red-hot molten steel with a hammer and talking with someone who knows where you’ve been and what you’ve been going through sounds appealing, perhaps Bladesmith Therapy is what you’ve been looking for. Visit the websites mentioned in this blog or click on Resources, Medical, Bladesmith Therapy for a list of veterans offering this program. As with all of our resources, they are listed by state and city so you can try to find someone near you.